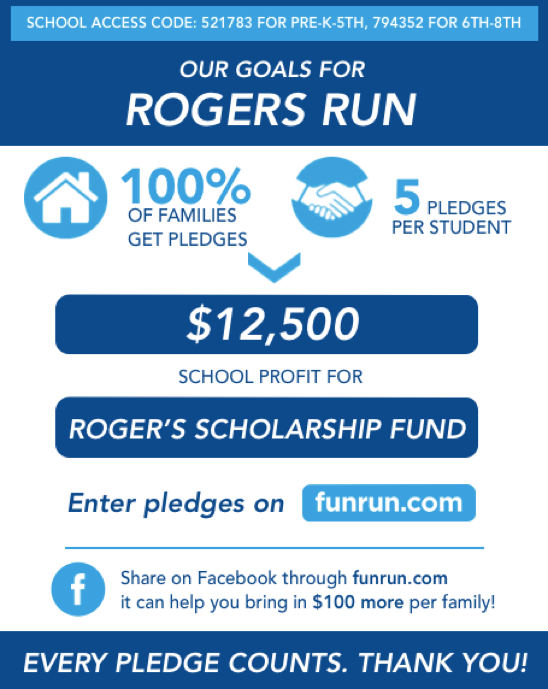 How to Register for the Rogers Run! October 20th at 9am! Registration for the Rogers Run is Now OPEN to FBA Students PK-8th Grade! *Families with more than one student in PK-5th grade or more than one student in 6th-8th grade may enroll register under one account. If a family has one student in PK-5th grade and one student in 6th-8th grade, each student must be enrolled under separate accounts with the appropriate grade code. If you are registering more than one student, you will be prompted to add the second student’s information on the next page. It is optional but highly encouraged that you add photos and/or videos to your page. 8. Share the pledge page link! Once the student is registered and their profile is customized, share the unique pledge page link! You can share this link with family, friends, coworkers, etc. You can also post the link directly on your social media platforms! Each donor will have the option to pledge a donation on a per lap basis or a flat amount. Inspired by long-time FBA supporter and grandparent to two FBA graduates, Orville Rogers, the annual Rogers Run is an opportunity for you to participate in either a 5K or 1 Mile Fun Run benefiting the Orville and Esther Beth Rogers Scholarship Fund for FBA tuition assistance. A portion of the proceeds go to the permanent Rogers Scholarship Fund and the remainder go to benefit current FBA students. While others dreamed of coasting for the latter part of their lives, Orville Rogers, at the age of 50, started running. Now, at age 99, with over 40,000 miles of track behind him, Mr. Rogers holds 14 world records including the 4×200 meter relay, the 4×8 relay, the indoor 800-meter, and the indoor mile, as well as American records in the 1,500 meter and 3,000 meter races in his age-range. The FBA family are witnesses to the life of faith lived by Orville and Esther Beth Rogers. To God be the glory. Thank you in advance to all of our amazing participants, faculty, supporters, and donors!